BASSET -Vue de Londres, prise de la Tamise. BASSET - Vue de Londres, prise de la Tamise. 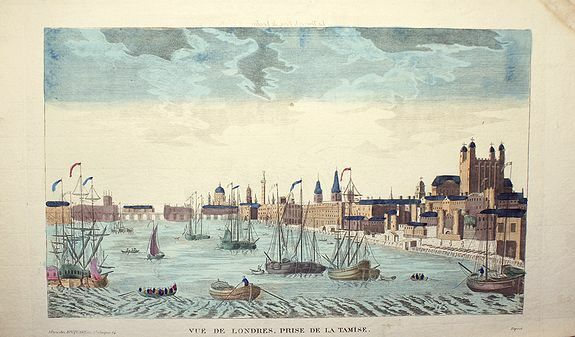 Title : Vue de Londres, prise de la Tamise.. Description :Optical print of London. Basset was a well-known publisher of optical prints, established in rue St Jacques in Paris. In the 18th century the optical print or vue d'optique came into existence, whose exaggerated converging lines were intended to produce the optical illusion of deep recession. Condition : Nice print with original colors. A slight wet stain on the top left margin.